What is My Job Chart? It is a free online job chore chart designed for children of any age to keep track of getting their chores done. A homeschooling dad of 6, Gregg Murset, actually designed it for his own family, but before he knew it, it turned into a big hit with many families! My Job Chart includes a reward system for teaching, organizing and motivating your kids to Save, Share and Spend responsibly. Check this video out to get an idea of how it works. My Job Chart couldn't have come at a better time for us. As a busy, homeschooling, blogging Mom, I have welcomed the help it has given me around the house! Sadly, the money I invested on the fridge charts may not have been the best purchase because they haven't been used for quite awhile now. (Although I hope I'll reuse them for something else some day!) The fact that it is so easy to add or delete chores on My Job Chart eliminates the problem I had before. And the fact that it's free means, if it didn't work for us, I didn't lose any money. With My Job Chart you can add simple things for your child like, "get dressed, comb your hair, make your bed," but also add more involved chores like "empty the dishwasher and do your homework". I like having the simple things on there because it encourages our children when they get to check something off that they normally would do anyways. You can also tailor the chart to your child's needs. For example, if you have a child who needs practice tying his shoes, you can help motivate him to practice by adding that to his list of "chores" for the day. My Job Chart is definitely helping things to run more smoothly in our home without me feeling like I'm constantly nagging the kids to get their chores done. Since the chores are already in the computer and for the most part, non-negotiable, it's much more pleasant for me to say, "Have you checked your chore chart? What can you check off now?" It gives our children independence, a sense of accomplishment and training in stewardship. Our children are motivated by the fun responsibility of checking off their chores when they're all done and seeing the points tally up as they do so. They love the clapping, too, on the program when they've completed all the chores for either the morning or evening. 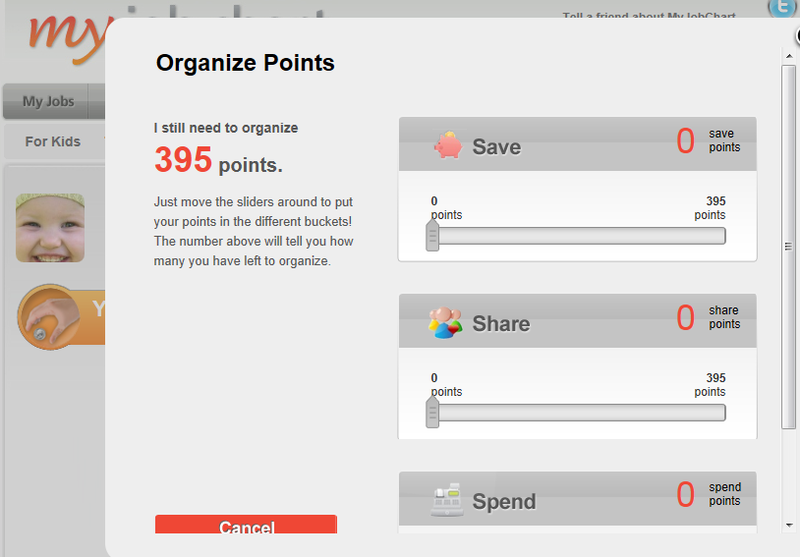 My Job Chart is also set up so you can have save, spend and share accounts as a reward system. Below is an example of Carlee's. She currently has 395 points and of those points, we can designate how many go into each category. 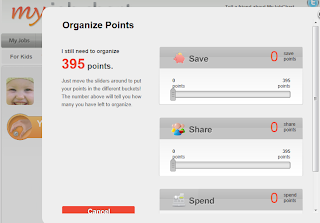 When you slide the tool over on save and designate 100 points, it automatically leaves 295 points to be divided up between the last two categories. Pretty clever, I'd say! Once the goals are reached for each category, we can then give them money for their bank, money to share (e.g. church, orphanage, etc.) 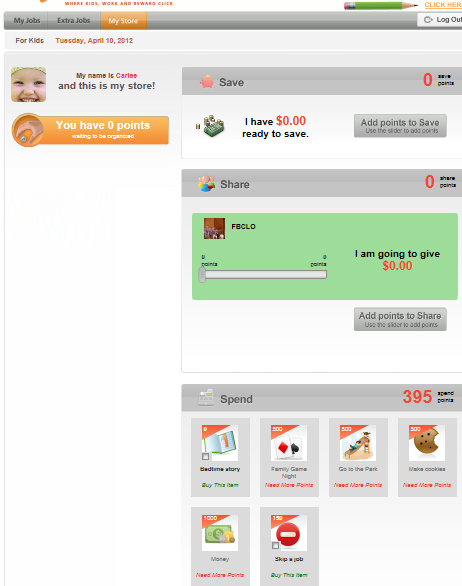 and points to spend on a prize of their choice such as going to the park, baking cookies, money, etc. When I asked our children what they thought about My Job Chart, our oldest said, "I like using the online chore chart better than the fridge chart because I can earn points and I can pick a big prize out of the prize bag. I like being able to check off my chores that I did and see how many points I get. I like it." So, all in all, I think it's a great program and I plan to stick with it for a long time. Who wouldn't if it was a free program that reduces stress, instills values in your children and frees up more time to enjoy with your family?? Thank you Greg for asking me to review My Job Chart. I am so glad you did! You might also like to know that My Job Chart has an exclusive arangement with ING Direct Bank that gives a $20 bonus for each Kids Savings Account that is opened. Also, be sure to find My Job Chart on Facebook. **Disclosure: Myjobchart.com is a current sponsor of Purposeful Homemaking, but I have given an accurate assessment of our experience with this program. All opinions expressed are my own.